By Rocky Bigbie, D.V.M., M.S., Article donated by the mane points horse resource center. 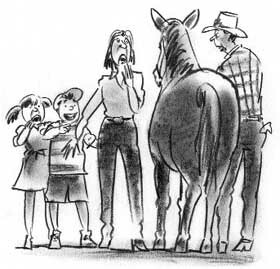 "My horse has the snots" conveys useful information about your horse's health. Horses with infectious upper respiratory disease are hard to love. The copious nasal discharge oozing from the nostrils rapidly depletes any desire to head-hug your equine companion. Not only does the nasal discharge diminish a horse's lovability, but other horse owners also may regard your horse as the dreaded leper of the barn. You may even be ostracized for so callously exposing the other horses to such an ugly fate. Most causes of upper respiratory disease are not life threatening, but cause severe anxiety and may predispose horses to life-threatening conditions. Most horse owners call an upper respiratory outbreak the flu, and the clinical signs of influenza and EHV are indistinguishable. Both make the horse very sick, and although a horse almost always recovers fully, the duration of the disease can be prolonged if misdiagnosed. Like EHV, equine influenza is a viral disease. The clinical signs seen with both diseases are fever, lethargy, nasal discharge, coughing and loss of appetite. Secondary to these signs, the patient can become dehydrated and even suffer signs of abdominal discomfort or colic. As all horse owners will agree, the equine loss of appetite is often more than a cause of casual concern. A horse that doesn't eat doesn't drink. A horse that doesn't drink doesn't urinate or defecate. A horse that doesn't urinate or defecate dies. So, although influenza or rhinopneumonitis are not considered life- threatening, death may occur if the clinical signs become severe enough. A large percentage of horses are vaccinated against equine influenza, but not against rhinopneumonitis. When surveyed, horse owners vaccinate most against eastern and western encephalitis, tetanus and influenza with the four-way vaccine. Unfortunately, this popular combination vaccine fails to protect the horse from rhinopneumonitis, an upper respiratory disease that may be as common as -- and indistinguishable from -- influenza. The immunity derived from vaccination for influenza or rhinopneumonitis is short-lived; therefore, in many horses, annual revaccination is inadequate. A booster vaccination against influenza and rhino should be given to extend immunity for these diseases. For many horses, an appropriate vaccination regimen would be a three-way combination containing eastern and western encephalitis and tetanus given in conjunction with a flu-rhino combination. That way the flu-rhino could be given every few months for horses under competitive stress or frequent disease exposure. Other owners may regard your horse as the dreaded leper of the barn. Since the immunity derived from the vaccination for sleeping sickness (encephalitis) and tetanus is much longer, an annual vaccination usually is adequate for them. In areas of the country prone to sleeping sickness, some veterinarians are recommending repeat vaccinations in the fall. In areas where Potomac Horse Fever (PHF) is a threat, a more appropriate four-way would be a PHF-EWT combination. All components of this vaccine will elicit longer immunity than flu-rhino vaccine. Equine influenza is a determined survivor. The virus continually changes in order to escape the diligent pursuit of the horse's immune system. The same is true of influenza virus in humans. As the virus evolves, the immune protection from a previous version of the virus may not protect against this year's mutant form. While cross-protection is essential for disease prevention, the weapons of immunity must recognize the virus as the intruder. The greater the variance between the disease virus and the one for which immunity is summoned, the greater the chance that the weapons of immunity will rush past the virus, searching for the real intruder. The failure to recognize the disease virus allows it to attack the horse's respiratory system and cause the disease. A strategic vaccination program is an important part of effective control. Even excellent protective immunity can be overwhelmed by bombardment with the infectious agent, and improper husbandry can also cause a vaccination program to fail. Young horses, who are more susceptible to most diseases, should be separated from older horses. Performance horses that are exposed more frequently and endure more stress should not be nose-to-nose with other horses. New additions to the herd must pass through a short quarantine phase before being introduced into the herd. This will allow the incubation period to pass, and signs of the disease will warn of a contagious status. Vaccination is an essential aspect of this program. The use of current vaccines with up-to-date and pertinent strains of virus will diminish the chance of disease outbreaks. Consult with your veterinarian to develop an immunization program specifically designed for your horse. Read the next horse diseases article on Rhinopneumonitis Respiratory Horse Disease.